President Jabbra congratulates this year’s winners and offers Mary Turner Lane up as inspiration to the LAU family. 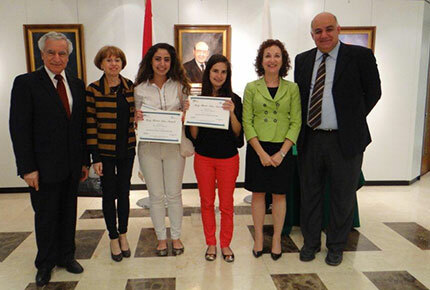 LAU President Joseph G. Jabbra, who presided over the award ceremony, personally congratulated the winners. Mary Turner Lane would be pleased with LAU students Joud Zaumot and Berna Ismail. The two have just won a prize in her name, the Mary Turner Lane Award, which is given annually by the Institute for Women’s Studies in the Arab World (IWSAW) to top student essays on the subject of gender. “We discovered to our great dismay that women were comfortable with the word work or job, but totally uncomfortable with the word career. Men, I believe, still have the same notion of lifetime work or career,” said Turner Lane during a 1987 interview about her research on the women of her university. Joud Zaumot embodies all the values that Turner Lane fought for. She is more than comfortable with the word career and has hers planned well in advance. Apart from being a MEPI scholar at LAU, she has just been offered a graduate scholarship to study finance this fall at Lund University. Her award-winning paper, also her capstone project, involves setting up an NGO in Jordan dedicated to ending honor crime. Director of the IWSAW, Dr. Samira Aghacy, describes the second winning essay by Berna Ismail as a “gripping, courageous testimony to virginity and the value Arab societies ascribe to the hymen.” Ismail’s journey toward awareness began two summers ago when a book unexpectedly grabbed her attention while she was waiting in line at a bookshop. “My hand immediately stretched toward it because its title made me anxious,” explains Ismail. It was The Hidden Face of Eve, Women in the Arab World by Dr. Nawal Al-Saadawi. She began reading the book as soon she got home and it changed her life. Ismail will be one of the first students to enroll in LAU’s Masters in Gender Studies to be launched this fall. In 1976, Mary Turner Lane became the first director of the Women’s Studies Curriculum at the University of North Carolina, a program that she had helped establish. For more than 30 years, Turner Lane championed women’s rights both on campus and beyond, at one point even serving as advisor to Egyptian government. In tribute to her mother’s work, her daughter, Mary Ellen Lane, established the award aimed at generating awareness about the IWSAW and the importance of conducting research in the field of women and gender studies.